Be sure to pack enough new golf balls for your round and try to learn what you can about the terrain of a new course in advance. During the course of a round of golf, players are encouraged to track every ball that they hit, to ensure that their ball is not lost. Unfortunately, this is not always possible. If a player loses sight of the ball, he is given five minutes to find it without penalty, and should bear several rules in mind when searching for the ball, to ensure he follows the rules of the game. When a golfer has lost the ball, she is entitled to seek out help from any one that is around and willing to help look for it. For most weekend golfers, this will amount to the playing partners in their group and, if they are lucky, some passers by from other groups that are playing on an adjacent hole. This rule can be very beneficial for pro golfers, however, who can seek out help from the gallery to ask if anyone saw where the ball landed, as well ask if anyone in the gallery can see the ball after a search has begun. When a golfer has lost sight of his ball, and fears that he may not recover the ball in time, he has the option of playing a provisional ball. A provisional ball is a second shot, played as if the first ball is lost, meaning off the tee again for a tee shot, or from a drop at the spot of the shot if the ball was hit from the fairway. The player must express the ball is a provisional before playing it. If the original ball is found, the provisional is picked up and does not count. If it is not, the player uses the provisional ball. Provisional balls are useful for saving the long walk out to find a ball, followed by a long walk back to replay the shot, and are considered good etiquette on a packed course to reduce the hold-up of trailing groups. Occasionally, in the course of looking for a ball that has been lost, the ball will be discovered in a location out of bounds according to the course design. Unfortunately, the player is not allowed to play the ball from an out of bounds position, and as such must suffer the penalties of playing a ball out of bounds. Fortunately, some consolation can be found in the player not having lost the ball, which can be returned to their bag for later--a valuable cost-saver for a weekend golfer. 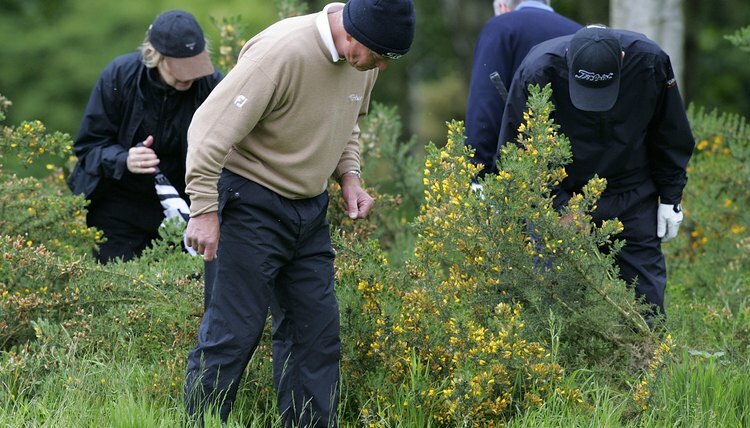 An unplayable lie is a situation where the ball has not been struck out of bounds, but has come to rest in a position in which it could not reasonably be played, such as in a bush. An unplayable lie can be played by the golfer whose ball is in the lie anywhere but a water hazard, however as golf is a game of honor, a golfer should not take advantage of this to better herself when a ball is truly playable. If a lie is unplayable, the golfer may play the next shot from the original position of the shot leading to the lie, from a drop within two club lengths to the unplayable lie that is no closer to the flag, or anywhere farther from the flag along the line running from the flag through the ball in its unplayable lie. When playing a second ball in the fairway, or moving from an unplayable lie, a player may have cause to drop a ball. When dropping a ball, the ball should be held at shoulder height over the point that it is to be dropped on. The ball is released with no extra trajectory in any direction, and allowed to roll freely upon landing. The player then plays the ball as it lies wherever it comes to rest, provided the new lie is playable.